Cub Scouts, Girl Scouts, and Boy Scouts all promise "to help other people at all times". 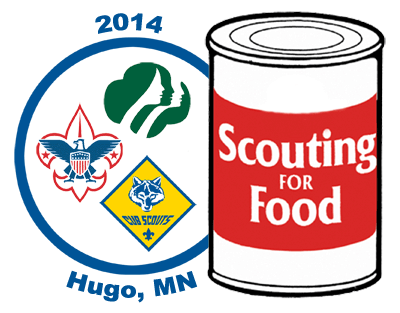 This is a great way to show our community spirit, working together in our annual Scouting for Food drive for Hugo's Good Neighbor's Food Shelf. * 11:30am - Kindergarten families have the option of arriving at Lions Park later, to help unload vehicles and share in lunch. Last year, through our combined effort, we collected nearly 1800 pounds of donations for Hugo’s Good Neighbors Food Shelf. Please let us know how many in your family will join us. We need a headcount for pizza.